It is almost a year since Vicky and Adams brilliant wedding last summer. Vicky was totally dedicated to creating the perfect day and her attention to detail was second to none. She spent months searching for their venue and finally found a farm near to Wootten Bassett, Wiltshire where they were able to hire a small field. Parsonage Farm set at the foot of the spectacular Ridgeway gave them the freedom to create a country wedding and best of all, with no neighbours, the band could be as loud as they wanted! The marriage ceremony was held at Malmesbury Town Hall. The room is fabulous with a high wooden framed ceiling and lots of tall windows which let in so much light. 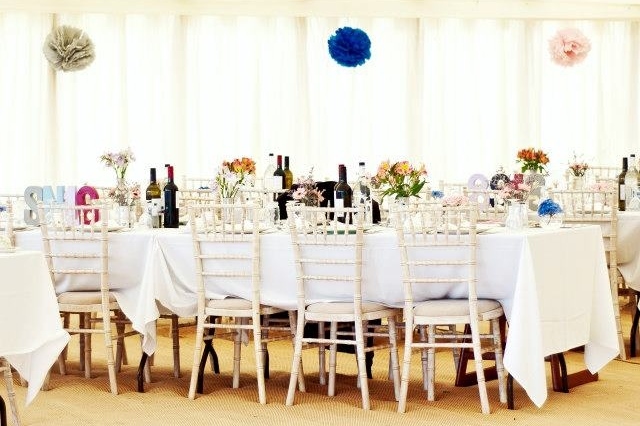 Vicky kept the decoration simple here with pale pink pompoms that she had painstakingly made herself, on the back of each chair and a few flowers. After the ceremony, guests met at the local pub for a quick drink before climbing aboard a green double decker bus that delivered everyone to Parsonage Farm. Vicky and Adam hired a large marque (find similar here) for their wedding breakfast and dancing, and a smaller one for their bar. The grass area in-between was set up as a seating area with straw bales, upside down wooden crates for tables and decorated with country flowers in tins. The effect was relaxed and so pretty, a bit like their own mini festival. From the bar and bales, guests sipped Prosecco whist watching other guest play croquet and football in the games area. Vicki used our barrels for tall tables in the bar, which fitted in with the theme perfectly and Milk churns full to the brim with brightly coloured stems added a wow effect to the entrance of both marques. Inside the large marque, she decorated the ceiling and chairs with more pompoms and the long tables were laden with crisp white table cloths and tins of flowers, the whole effect was fantastic. Guests were fed a delicious pig roast with big bowls of salad and potatoes, followed by strawberry’s and chocolate cake and then after some serious dancing, refuelled at the fish and chip van they had hired for the evening! 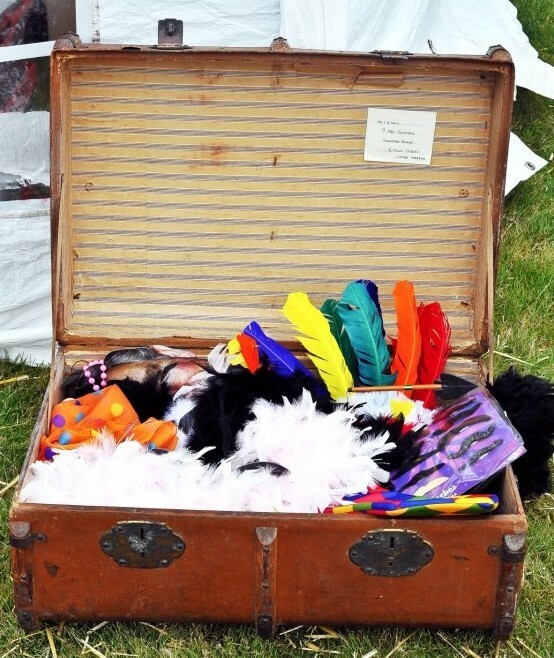 A vintage suitcase stuffed full with feather boas, giant glasses and a variety of hats only added to the entertainment on the dance floor. The relaxed country style of the day made for a fantastic party. I say day, celebrations carried on well into Sunday morning. Must have been the wonderfully fresh Wiltshire air! If you’d like to re-create this look, we have oak barrels, milk churns, apple crates, lots of lovely vintage leather suitcases and a croquet set for hire.